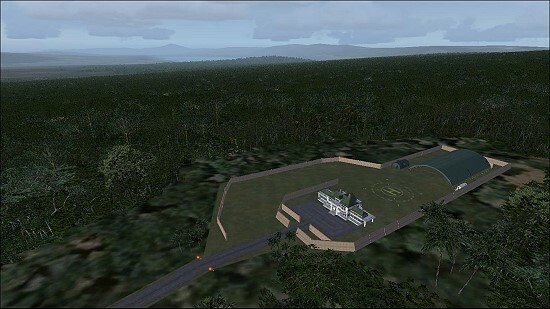 Siberut AB is a (Fictional) Air Base of the GPEO which is a group (Virtual Air Force) that stands for, displays and promotes Freedom. The Scenery is mostly for Military Operations Excitement and Fun, though the scenery can be fun for Bush flying. It is detailed down to Street level with the Lights on the Roads, Taxi signs with directions, and more. 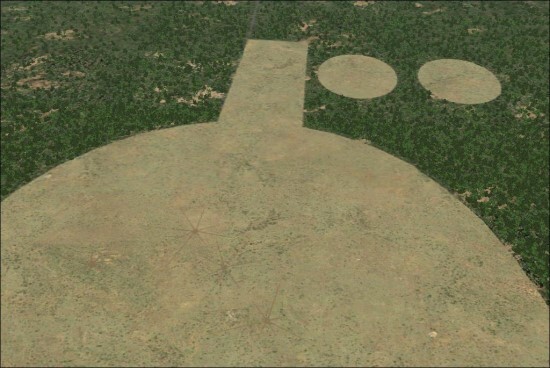 There is a Bombing Range with craters on it which is about 20 Miles out from the main base at a heading of 320; a Beach for practicing C-130 combat landings and take offs or any other heavy STOL craft or even Bush planes, (it is to the North a ways on another Island about 59 Miles out from Siberut AB, at a heading of 334). 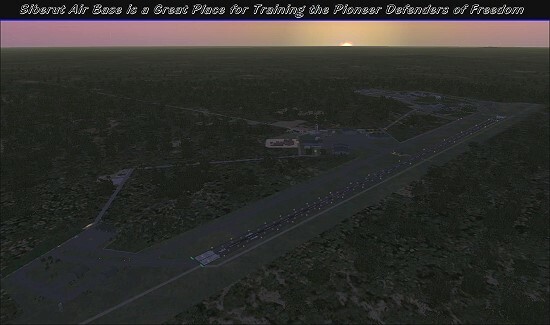 There is a small field and a short grass runway just a few miles outside of the main base, about 7 Miles from the base at a heading of 030, and could be used for various types of small military cargo or Bush style craft (great for C-130’s) to practice combat landing and take offs. The main Base (which is the biggest airport in the area) features an area for Fighters on the North end of the base which could house comfortably 16 or more fighter craft. The base has 6 fighter standby areas, 2 to the South at the end of Runway 9, and 4 on the North end of runway 27. Near the main fighter parking/hanger area is a Loading Area for Cargo planes which has a Warehouse for storage along with some truck and forklifts parked around ready to unload or load cargo planes. 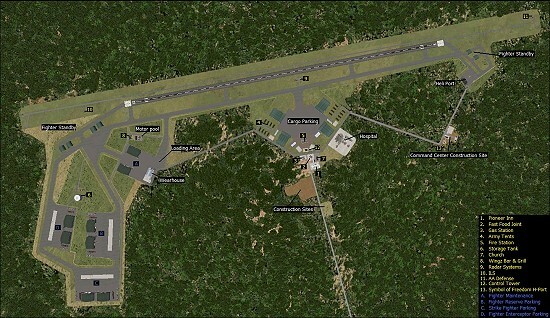 In the mid section of the base there is an area for Cargo or Transport style aircraft parking. To the South end of the Base there is a Chopper Port, with some hangers for choppers. In some places the base has a look which gives it a feeling that it is under Construction, with several Dozers parked along the sides of roads, or in cleared out fields (a story giving the reason for construction sites all over is toward the bottom of this description). If driving around on the ground with a vehicle you may see a Hotel, Gas Station (the gas station actually fuels you up if you park there). There is a Church, a Fast Food restaurant, a Hospital, a Motor pool, (which is inside the main base). 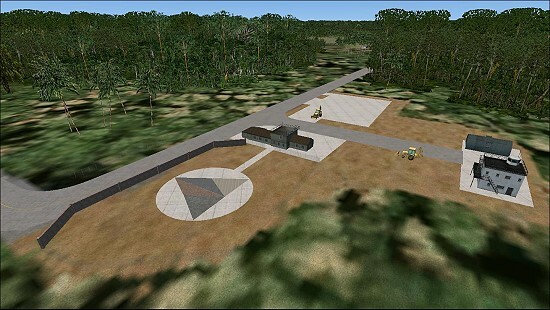 A small area under construction with an area prospected to be a future command center, with a detailed Chopper Pad built as the GPEO Symbol of Freedom, which symbolizes that Freedom is being constructed and maintained. On the Mainland of Sumatra there is a Special Compound which has an extended Hanger with a fuel station and a barracks building, a small mansion and a chopper pad. The Compounds coordinates are LAT: S0 26.30 – LON: E100 30.96, or is about 127 Miles at a heading of 060 from the main base, between two large lakes, about 8 Miles North of the Southern lake (on the mainland of Sumatra). A small Fighter Type craft and a Chopper could be housed there at the Compound. From the Compound there is a road leading to the main highway, which could be used for small aircraft to take off and land on, but it is tricky and bumpy. There is a radio post where the road meets the intersection which has a parking lot, and a radio tower. 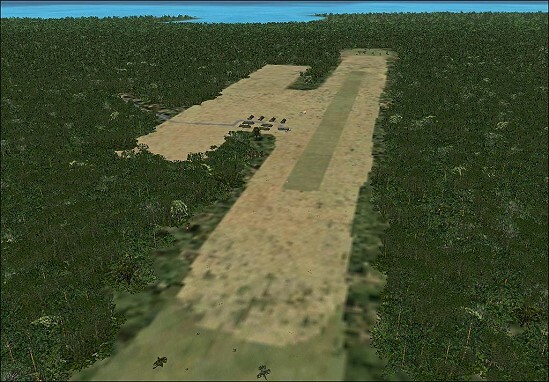 (FSX VR-World Story) Siberut AB was constructed as a result of the FSX Revolutionary War of 2007-2008. The base was to be used as a Forward Defensive position for protecting the strategic Port City of Singapore from potential attacks from the Indian Ocean, West of Sumatra. Although the Revolutionary War ended before its construction was completed, the base eventually housed some P-3 Orion’s which were used to patrol the waters for locating and monitoring potential submarine and other Naval threats. In 2010, the base was allegedly attacked by Naval Units from one of the Rivals (enemy factions) of the GPEO. The enemy used choppers from a Carrier Fleet and the base was allegedly infiltrated by Special Forces which allegedly set up ambushes and damaged several cargo planes and vehicles. The enemy claims to have commandeered a C-5A and claimed to have used it in an attempt to cause damage or to capture a base in Singapore, however there were no C-5’s at Siberut at the time, nor was a C-5 ever present at the base since it has been constructed, however there was one C-130 and it remained at the base along with some Fighters. Eventually The Battle Hardened GPEO SPOND Units later smoked out and captured these supposed ‘Elite Special Forces’ assailants (which were incapable of shooting straight). The supposed carrier fleet disappeared and was never picked up on radar which leads to the possibility that a submarine might have slipped in and dropped off some inexperienced ground forces to infiltrate the base. Currently the base is undergoing upgrades, repairs and development, while still conducting training and defense operations. The locals in the area claim that they enjoy the presence of this base which gives them opportunities for education and work opportunities, along with the enlistment into the GPEO itself to be ‘Defenders of Freedom’ and their land, and they show their gratitude and show their support for the cause of Freedom and Humanity in the region. The base employs several locals to help with the construction and maintenance of the base, along with educational programs. In return, the GPEO helps with protecting the national parks of the Island and supplies the locals with luxuries and supplies; along with the continued support of the region should the locals ever become the target of a potential external threat or the oppression from other factions. The locals have the understanding that the GPEO is not governing them in any way and continues to spread the word and cause of Freedom in the region. Siberut is and will continue to be used for future war-games and training operations of all kinds which will enable forces of the GPEO to better fight the Enemies of Freedom and to continue the defense of Siberut Island, as well as the continued forward defense of Singapore. As long as the locals continue to show their support and desire to be part of such cause, the Pioneers of Freedom will continue to operate there in the name of Freedom and Humanity.